Dogs are wonderful pets, but they’re widely known for their ability to get into trouble when left unattended. Such is the case of a Shar-Pei mix in Cathedral City, California. A Shar-Pei mixed dog has been given the nickname Wally after he was found wedged in the six-inch gap between two six-foot-high cinder block walls. It’s quite possible that Wally found an even-tighter squeeze than the dog stuck in a recliner did! According to Riverside Animal Services Department spokesman John Welsh, it is believed that Wally got wedged in the tiny crevasse after chasing a rabbit or some other small game into the gap. 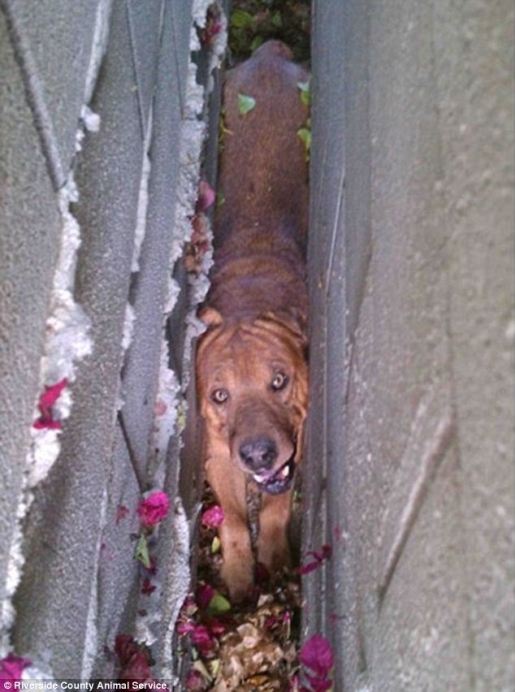 It took about 40 minutes for Riverside County authorities knocked down one of the six-foot-high walls keeping Wally stuck. He was extracted, given water and a bean and cheese burrito to eat, and was taken to nearby Coachella Valley Animal Campus in Thousand Palms for examination and rehydration. Wally is believed to be about 4 years old and was in good health in spite of his harrowing ordeal. If his owners do not come forward, the dog will be put up for adoption. It is unknown how long Wally was stuck between the walls before his predicament was discovered.